2823 Private Herbert Leslie SCHRAMM, a 22 year old Farmer from Whites River, South Australia. He enlisted on 17 February 1916; and at the conclusion of the war Returned to Australia, 10 July 1919. During part of the course of his military service with the AIF, Bert Schramm kept a diary of his life. Bert was not a man of letters so this diary was produced with great effort on his behalf. Bert made a promise to his sweetheart, Lucy Solley, that he would do so after he received the blank pocket notebook wherein these entries are found. As a Brigade Scout since September 1918, he took a lead part in the September Offensive by the Allied forces in Palestine. 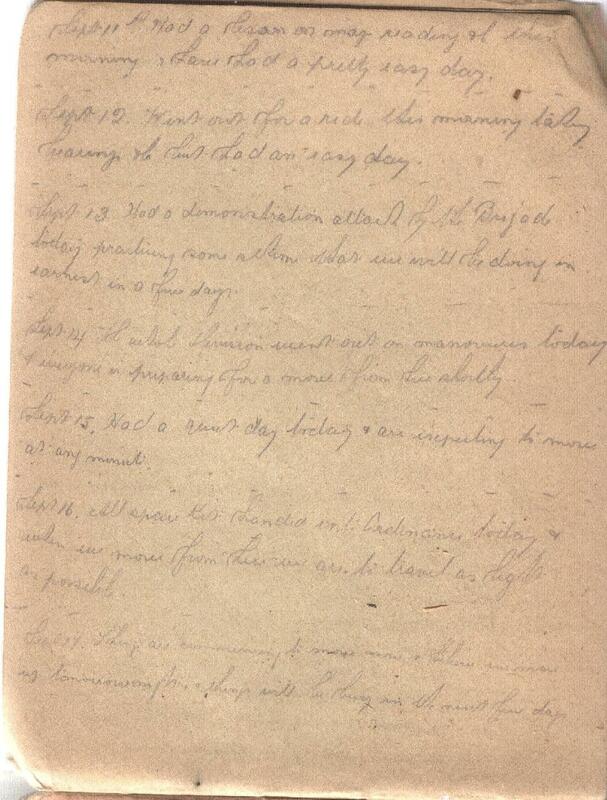 Bert's diary entries are placed alongside those of the 9th Light Horse Regiment to which he belonged and to the 3rd Light Horse Brigade to which the 9th LHR was attached. On this basis we can follow Bert in the context of his formation. Bert Schramm's Diary - All spare kits handed into ordinance today and when we move from here we are to travel as light as possible. 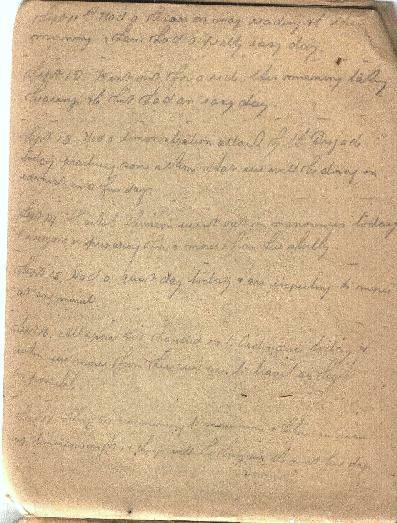 9th Light Horse Regiment War Diary - Syllabus of training for week ending 21st September 1918 issued. 1430 Demonstration at Richon le Zion of massed overhead machinegun fire. All officers attended. 3rd and 4th Machine Gun Squadrons and NZ Machine Gun Squadrons demonstrated with overhead and flank fire whilst 5th Light Horse Brigade carried out the charge mounted. Darley, TH, With the Ninth Light Horse in the Great War, Adelaide, Hassell Press, 1924.